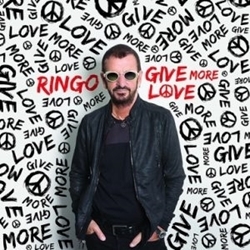 Music Review: Ringo Starr - 'Give More Love'. Beatles Radio: The Beatles, Solos, Covers, Birthdays, News The Fab 4 and More! Ringo Starr's nineteenth studio album goes down like a serving of musical comfort food. Much like a "value meal" at a fast food chain, Give More Love delivers exactly what one expects from it. And it may not linger in the memory for very long following consumption. If you've heard any of Starr's recent releases, including 2015's Postcards from Paradise, there aren't any real surprises. At least not on the ten all-new tracks, each composed by Starr with one of his regular collaborators, that make up the proper album. Though not listed as such on the CD, the four "re-dos" of older songs are apparently bonus tracks (they're also part of the digital edition, just not the vinyl). Among the ten new cuts, album-opener "We're On the Road Again" is the highlight-a boisterous, uptempo rocker built around a slithering guitar lick by Steve Lukather (of Toto). Paul McCartney provides a fluid bass line and occasionally pipes in with howled backing vocals. McCartney's bass also anchors a melodic ballad, "Show Me the Way." This isn't the Peter Frampton tune, though Frampton shows up elsewhere as co-writer of the vaguely topical "Laughable." Society is "going to hell," Starr warbles, "but not forever" he's quick to assure. The answer to all our problems? "We need to come together." Back to the comfort food analogy, that's Ringo for you-his lyrics are liberally sprinkled with callbacks to past glories, steeped in platitudes, and deployed within chord progressions often cobbled together from his other tunes.